36 Kids Who Had A Total Nightmare Playing "Knightmare"
Knightmare was the best kids' TV show of all time. It was also ludicrously difficult. Here are nine teams who couldn't handle the dungeon of deceit. If you were a kid in the late '80s and early '90s, Knightmare was the highlight of your week. It had everything: dungeons, goblins, teams of confused teenagers from far flung places like Middlesbrough and Slough... and, of course, high tech CGI sequences featuring a worried-looking disembodied head, a.k.a. the dungeoneers' 'life force'. It had an unforgettable intro. A knight.... riding a mare. Genius. If you're feeling particularly nostalgic, you can listen to the theme tune here. Two unforgettable intros, in fact. The cartoon intro was eventually replaced with a more 'realistic' one, although it isn't particularly accurate. If it was, this kid would be slowly sidestepping past the snake-thing while three of his friends panicked and shouted conflicting instructions. ...and the coolest dungeon master of all time. Treguard - played by Hugo Myatt - was a legend. Due to the unpredictable nature of the programme he had to improvise the most of his lines, but he was always so polished that you'd never guess he was making it up as he went along. But most importantly, it was EXTREMELY difficult. Very few would be dungeoneers managed to beat the game. Most failed at the first hurdle, and by 'hurdle' we mean 'underemployed actor dressed as a sword wielding monk'. Here are eight contestants who didn't stand a chance. 1. Simon, David, Matthew and Nicholas from Cornwall. If you had any doubt in your mind about what winning Knightmare meant to this team, all you have to do is look at the guy in the middle. 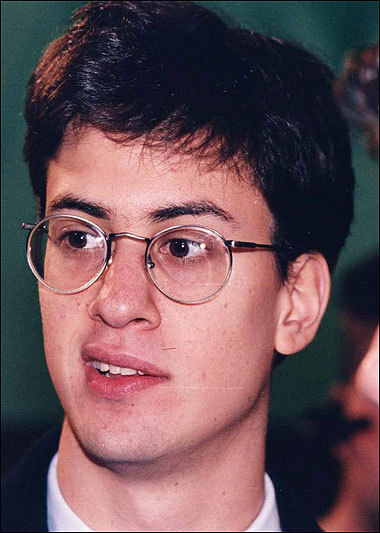 He looks like a young Ed Miliband being told that he'll never win a general election. They got all the way to level three, touched the wrong card in the 'play your cards right' challenge and plunged to their doom. Ooh, nasty. 2. Andrew, Simon, Richard and Andrew from Swansea. This blundering foursome managed to get to level two, but shortly afterwards one of Simon's advisors told him to sidestep into a pit. Was it an accident, or did he just really hate Simon? We'll never know. Dungeoneering tip: it's always a good idea to write a big L and R on the backs of your hands before starting your quest. 3. Leo, Matthew, Simon and James from Bromley. These guys made it to level three only to end their quest in an animated sequence that wouldn't look out of place in an episode of Monty Python's Flying Circus. Turns out a gargoyle who they encountered earlier in their quest could have told them which way to go in this room, but didn't. Cheers, gargoyle. 4. Scott, Jeremy, Nathan and Ian from Ash Vale. Whatever they were paying him, it really wasn't enough. 4a. Scott, Jeremy, Nathan and Ian (again). Jeremy, Nathan and Ian had already proved that they had a profound lack of spatial awareness during the wall/door incident above, so why Scott agreed to jump across a chasm for them is a bit of a mystery: he could have sprained something. Still, it's worth it for this great death animation that makes it look like Scott has suddenly turned into a 2D cardboard cutout of himself. 5. Richard, Angela, Rebecca and Rowena from Bracknell. Angela, Rebecca and Rowena's nightmare started well before they got to the studio. Their friend Angel dropped out at the last minute and the production team replaced her with 15 year old Richard, who got in trouble for looking down a cast member's top at one point. They lasted a measly 14 minutes before getting roasted by the red dragon Bhal-Shebah (presumably operated by an angry female actor). 6. Nathan, Karen, Stephen and Cath from Southampton. Like poor, sidestepping Simon in #2, Nathan was abruptly guided to his death by a directionally challenged advisor. A shame, as they'd made it all the way to level three and successfully navigated the incredibly irritating 'play your cards right' challenge that killed off Ed Miliband's team. 7. Chris, Paul, Keith and Ciarán from London. Don't you hate it when you spend 40 minutes carefully navigating a fictional dungeon only to end up being eaten by a wall that looks like Pete Burns? These Londoners failed to get the password for this section earlier in their quest and used a unrelated colour code instead, which Chris managed to get wrong. They totally deserved to be eaten by a collection of bricks with surprisingly good cheekbones. 8. Daniel, Benjamin, Gideon and Justin from London. In a 1996 interview, Knightmare creator Tim Child said that these four boys were his 'outstanding' memory of the series. They found the quest so tricky that they couldn't stop blaspheming: something that wasn't allowed on CITV at the time. "We had a lot of editing to do," he explained. "We cut out about 200 "Oh Gods". Most of the 'Oh Gods' were probably caused by this stressful sequence in the Corridor of Blades that saw 11 year old Daniel cut down in his prime. 9. Gavin, Tom, Craig and Brian from Glasgow. Poor Gavin, Tom, Craig and Brian. Their quest only lasted 11 minutes: hardly worth the bus fare from Scotland. They managed to make through room two with the help of dungeon maid 'Mellisandre' (interesting name. Is George R.R. Martin a Knightmare fan?) only to direct their friend into a patch of quicksand seconds later. In 2001, Gavin emailed fan site Knightmare.com to admit that their quest shouldn't even have lasted 11 minutes. "We actually died on the Serpent's Tongue but were allowed to carry on because the next team had not yet arrived at the studios! Our directional sense was poor to say the least and we still have arguments as to who's fault it was." Allow us to clear it up for you: Gavin, it was your fault. And keep telling yourself: it's only a game.... isn't it?